First of all, just in case you don't know HVAC symbols stand for (Heating, Ventilation and Air Conditioning). This page is for you if you’re in the process of designing a home and it’s time to check your blueprints for the impact that the HVAC arrangements will have on the design. 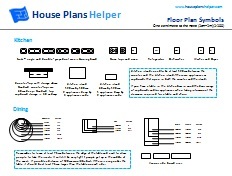 Don't miss out on your free blueprint and floor plan symbols. Go ahead and fill in the form below. I’m not going to try and talk about the ins and outs of heating or air conditioning – because I know very little about these things. This isn't about checking whether or not your home will be warm enough - that's the job of the HVAC engineer. But I’ve seen ugly boxes enclosing HVAC and vents in bad places. It's not necessarily the job of the HVAC engineer to make it beautiful! So this page has a checklist to make sure this sort of thing doesn’t happen in your home design. 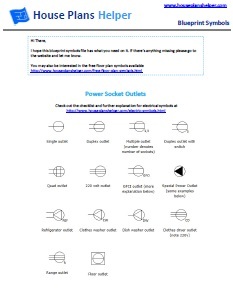 Get your free blueprint symbols file which includes all the blueprint symbols. Most of the HVAC symbols used on blueprints have become standard. Some architects or designers may use slightly different symbols. Always check with the key on your blueprints. Location of furnace – check that you’re happy with the location of the furnace. Is the noise from the furnace insulated as much as possible? Location of external machinery vents – think about the drafts and noise created by external machinery and vents. Are they in as unobtrusive a position as possible? Location of floor and wall vents - make sure they're not going to blow your curtains all over the place. Make sure that they fit in with where you're planning to put your furniture. Location of internal vents. If you want your vents in the floor make sure they’re specified in the floor and not the wall or the ceiling. Where are the controls for heating / cooling placed? There might be several if you have asked for controls for each floor. Are the thermostats in a sensible position (including the height)? Controls should be placed between 36" and 48" (91.5 – 12.2cm) high. If you have kids at home the higher height is better. Location of duct work. There will be vents inside the house (running horizontally from room to room and vertically between floors). Check to see where these vents are and how they are enclosed (if you want them enclosed). Sometimes it’s well done and forms part of the floor or is cleverly enclosed in the back of a cupboard and sometimes it’s a really ugly box running along the top or side of a wall. Just check and see where the vents are running inside the house and that you’re going to be happy with the appearance. If you're having an internal vacuum fitted make sure you're happy with the location of the vacuum trap and outlets. Make sure you're happy with the location of the kitchen exhaust and tumble dryer exhaust if applicable.